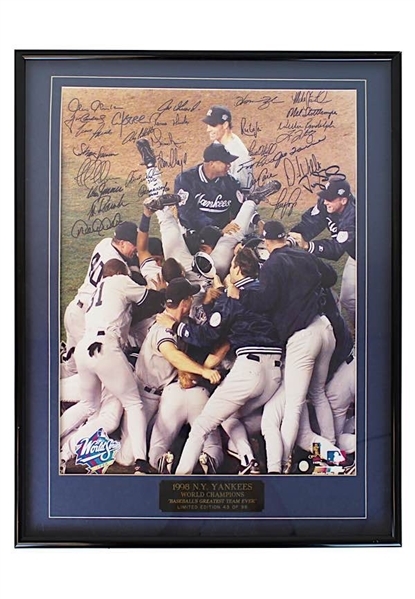 This approximately 20x24” framed picture depicts the New York Yankees celebrating the 1998 World Series and reads “1998 N.Y. Yankees WORLD CHAMPIONS “BASEBALL’S GREATEST TEAM EVER LIMITED EDITION 43 OF 98”. The picture has been team-signed in black marker and are highlighted by Derek Jeter, Mariano Rivera, Paul O’Neill, David Cone, David Wells and many others. Accompanied by a LOA from JSA.